The directors of the trusts lacked business acumen and the negotiations in respect of the transaction had been almost concluded wholly by the settlors based in UK, which resulted in POEM being UK. 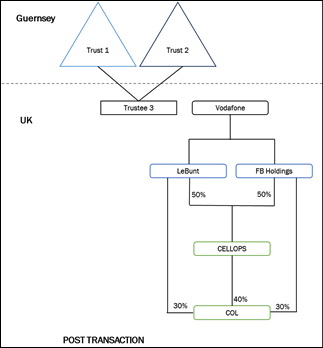 Recently, the United Kingdom’s First Tier Tribunal (“Tribunal”), in the case of Richard Lee & Nigel Bunter v. The Commissioner for Her Majesty’s Revenue and Customs1, ruled on the Place of Effective Management (“POEM”) of two Guernsey based trusts having UK settlors and a Mauritius based trustee at the time of a transaction of transfer of shares. The Tribunal after analyzing facts, witness statements and evidence ruled that even though the execution of the transaction took place in Mauritius by virtue of the trustee being in Mauritius, the trustee only acted under instructions of the settlors who were based in the UK; thereby resulting in the POEM of the trusts being in UK and hence resulting in tax being leviable on the transaction that took place. The ruling can be useful in understanding the concept of POEM, which was introduced in India’s tax framework in the Budget of the year 2015. Earlier, the Indian Income Tax Act, 1961 (“ITA”) contained an objective test for determination of residence of a foreign company, wherein a foreign company was considered a resident in India only if the control and management of its affairs was wholly situated in India. However, the Finance Act 2015 replaced the (almost) 100-year-old test for corporate residence with POEM. This change was met with a lot of hue and cry among the investor community which resulted in the POEM test being deferred for a year. The test has however become effective from April 1, 2016. This summary of the judgment of the Tribunal summarizes the facts of the case along with the approach adopted by the Tribunal in reaching its decision. It also makes a comparison of the differences and similarities with the concept of POEM in UK and in India. Since the test of POEM in India has been borrowed from international jurisprudence, the interpretation of this concept under an OECD based tax treaty should provide much needed guidance to Indian courts for interpreting POEM. Facts: Two individuals had formed a UK off-the-shelf company, Cellular Operations Limited (“COL”). They were also the directors of COL. Two more companies were incorporated by them in Guernsey, LeBunt Holdings Limited (“LeBunt”) and FB Holdings Limited (“FB Holdings”), the shares of which were subscribed by two Guernsey nominee companies (“Nominee Companies”). 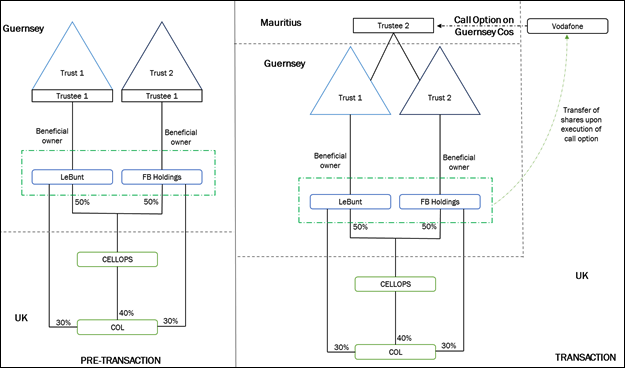 The two individuals had each set up a trust in Guernsey (“Trust 1 / Trust 2”, collectively “Trusts”) whereby each of them, apart from being settlors to their trusts were also one of the beneficiaries. The trustee of each of the Settlements was the Spread Trustee Company Limited (“Trustee 1”), also a Guernsey company, on whose behalf the Nominee Companies held the issued shares in LeBunt and FB Holdings. The beneficial owners of shares of the companies were each of the Trusts that were set up by the individuals in Guernsey. LeBunt and FB Holdings acquired another off-the-shelf company - Cellops Limited (“Cellops”) in which each held 50% stake. Cellops in turn went on to hold 40% of COL, a company engaged in the mobile telephone business. Law surrounding the issue: In terms of the law surrounding the above, it should be noted that under UK law, trustees of a settlement are treated as a single continuing body of persons.2 Further, the place of residence of a trust is generally determined by the residence of the trustee unless the trustee is also ordinarily resident in the UK, or a foreign trustee is the trustee of the trust throughout the year; in which case the trust’s income is taxed at the hands of the settlor in UK. However, since in the present case, the trustee of the Trusts was initially in Guernsey then in Mauritius and finally in UK in the same year, the Trusts’ income would be subject to tax at the hands of the Trustee. Therefore it was the trustee whose residence would determine the tax liability of the Transaction. Residence of the trust at the point of the Transaction was to be determined with reference to the trustee. However, if it could be demonstrated that the residence of the Trusts was in Mauritius, by virtue of the UK – Mauritius Double Avoidance Agreement (“Treaty”), the Treaty would determine the right to charge the gains accruing to the Trusts from the Transaction. Additionally, at this juncture, it should be noted that the Transaction and the change in trustee was designed so that the Trusts could take benefit of the ‘round the world scheme’. The round the world scheme was to ensure that the relevant Trust was resident in an overseas territory with which the UK has a Treaty for part of the tax year and the gains are accrued while it is so resident, and that it is resident in the UK for the remaining part of the tax year. Under the Treaty, Mauritius had the right to tax the gains from sale of shares. Since there is no capital gains tax in Mauritius, no tax would be payable by the Trusts upon completion of the Transaction. The issue before the Tribunal was whether the POEM of the Trusts was in UK or in Mauritius to determine the residency of the Trusts under the Treaty at the time of the Transaction. The Tribunal applied the test laid down by the UK High Court in Smallwood3 to determine whether the POEM exists - where were the important decisions on governance or management of the settlement located? The Tribunal identified key decisions relating to the governance / management of the Trusts. The decision for disposal of (almost all) assets of the Trusts, and the pricing of the Transaction was identified as the fundamental determinative factor. With respect to the decision making for disposal of the assets of the Trusts, the Tribunal examined the competence of the directors of Trustee 2 – and concluded that the choice of the directors of Trustee 2 was not based on business acumen possessed by them, but rather only on the location of the Trustee 2. Based on the witness statement of Mr. Gujadhur, the Tribunal concluded that he did not have an understanding of critical aspects of the Transaction i.e. the meaning of a put / call option, and therefore the decision to dispose the assets could not have been based on Trustee 2 ‘s independent judgment. On the question of management and independence of Trustee 2 being able to take /reject the decision, the Tribunal dismissed the possibility of non-execution of Transaction documentation by the Mauritius directors as a ‘fanciful proposition’ i.e. it was an unlikely eventuality that the Mauritius directors of Trustee 2 would not sign the Transaction documentation. The Tribunal noted that Mr Gujadhur (or any other director of the Trustee 2) was not party to the discussions and negotiations with Vodafone on the commercials of the Transaction for accelerating the call option exercise. The Transaction negotiations with Vodafone had been concluded almost wholly by the settlors, who were also directors in COL, and by their lawyers in UK before Trustee 2 was brought on board. A short memorandum on the Transaction which set out indicative figures of the sale price was prepared by the lawyers and was sent to Mr. Gujadhur. The minutes of the board meeting of Trustee 2 were materially identical to this memorandum. This further illustrates the lack of independent decision making exercised by Trustee 2. The Tribunal also gave due regard to the nature and timing of the Transaction. Specifically, the fact that Trustee 2 resigned within days of completion of the Transaction. The Tribunal also took note that the reasons for the resignation were explained as ‘tax planning advice’ in one of the minutes of the meetings in which the resignation was considered. Considering the above, the Tribunal ruled that the advice taken by Mr. Gujadhur from the settlors of the Trusts and the lawyers involved in the Transaction would cross the threshold of ‘advice’ and fall within the meaning of ‘instructions’. Therefore, it ruled that Trustee 2 was merely acting on the instructions given to them rather than being able to come to a decision independently for the disposal of assets. Further, the Tribunal did consider that Trustee 2 would not have acted in an unlawful manner or exposed its liability in respect of actions to be taken for the Transaction. However, noting that there was no risk of either, the Tribunal was of the view that the key decisions relating to the sale were taken in UK, and not by the Mauritius directors of Trustee 2. The Trusts had shifted residencies over three jurisdictions in a single financial year. The Tribunal also stressed on the fact that Trustee 2 was well aware that it had a limited role in the management of the Trusts and was engaged merely to claim residency in Mauritius. Therefore, Trustee 2 was only appointed to take benefit of the Treaty and was not involved in the independent effective management of the Trusts. ’Different persons’ issue: The Tribunal dismissed the hypothetical ‘snapshot’ argument dealing with residency of a trust across multiple jurisdictions in a single tax year. However, the Tribunal briefly touched upon the argument of taxation of trust versus the trustee, as the former is taxed as per Mauritius law and the latter as per UK law. The issue revolved around whether the Treaty can be used in a circumstance where different entities are being taxed in Mauritius and UK albeit in respect of the same income. The Tribunal was of the view that the focus of the Treaty was to tax streams of income, and did not differentiate based on the identity of the person liable to tax. The Tribunal held that the POEM of the Trusts was in UK. This was primarily based on internal correspondence, witness statements, facts and documentation concerning the Transaction. On a broad overview of the management of the Trusts, it would prima facie appear that the day to day management of the Trusts was carried out in Mauritius. However, by considering the intricacies of the evidence on record, the judgment provides a guiding light to tax courts / revenue authorities to determine POEM of an entity. The judgment also lays down the importance of evidence for a POEM determination. It has taken a fact based approach to come to its conclusions. More particularly, emphasis was placed on the correspondence between the settlors, and lawyers with the Mauritius administrators. Importantly, the Tribunal analyzed how the Mauritius director lacked business acumen or basic understanding of the Transaction, and was therefore incompetent to have exercised independent decision making. As already stated above, in 2015, the Finance Act amended Section 6(3) of the ITA to provide that a foreign company would be considered to be a tax resident of India if its’ POEM’ was found to be situated in India. In order to make a POEM determination, the Central Board of Direct Taxes ("CBDT") recently issued circular4 containing guiding principles (“Guidelines”) to be taken into account during the determination of POEM of a foreign company. We have analyzed below these Guidelines vis-à-vis the approach taken by the Tribunal in UK. The Guidelines provide that substance shall overtake form and maintain that a determination of POEM will depend on facts and circumstances of each case. They reiterate that no single guiding principle will be decisive and that activities performed by a foreign company over a period of time will be considered. The Tribunal has in fact also taken a similar approach. The judgment has gone into the fundamental question of the residence of the decision maker of the Transaction in light of the ‘around the world scheme’. However, a differentiating factor is that, in India, it is unusual to see courts examine witness statements of key management to determine the competency of such management to take key decisions. In fact, there are no Indian judgments which provide for such an objective test even in the larger context of substance. Further, the Guidelines shun a ‘snapshot approach’ based on isolated facts that do not establish effective management to determine POEM. As per the Guidelines, having Indian directors, local management in India or Indian support function would not be conclusive of POEM in India. The Tribunal in its judgment has also sought to determine POEM basis actual decision making rather than day to day administration. In this case, the Trust conducted board meetings which considered the Transaction in detail, and also engaged legal advisors to provide sound advice on the Transaction, which were noted but considered irrelevant by the Tribunal to determine POEM. Typically, from an Indian perspective foreign entities are advised that board meetings should be conducted outside India where the decision making is carried out, and documentation concerning such board meetings should also be properly maintained. However, the Guidelines specifically state that the mere recording of board minutes will not be reflective of necessary control or management. Since India is now moving towards a substance driven approach, this judgment is particularly useful for understanding the principles based on which POEM can be determined. The Guidelines state that if the foreign company fulfils the ‘active business outside India’ (“ABOI”) test, then such companies shall benefit from a presumption that their POEM is outside India (provided a majority of the board meetings of such company take place outside India, and the board actively exercises its powers of management). For this analysis, relevant factors include value of assets, active business outside, location of key management / exercise of powers by holding companies and shareholders etc. which are more subjective in nature and may lead to long drawn litigation. This is in sharp contrast to the approach taken by the Tribunal. The judgment provides for an objective test to determine POEM in a straight forward manner. In fact, such an approach by the Tribunal also highlights an important issue with respect to shell or post box companies. Owing to the objective test laid down by the Tribunal, it is unlikely that a company would pass the test of POEM on the basis of administrators running the day to day management outside India, and key decisions being authorized in India, although executed outside. Subjective tests as laid down in the Guidelines can result in long drawn litigation which can be avoided if a more simplistic approach is adhered to by the Indian revenue authorities. The Guidelines state that foreign companies that do not meet the ABOI test are subject to a two-step test to determine POEM. Step 1 involves the identification of the persons who make the key commercial or management decisions of such company, while Step 2 involves determining the place where such decisions are made. In light of Step 2, it would be interesting to see whether the conclusion of POEM by the Tribunal in UK would have been different if the key management in UK were to come down to Mauritius to carry out the Transaction from its inception (i.e. negotiations and pricing)? Please of management is especially relevant for Indian global entrepreneurs who carry out operations outside India but spend considerable time within India. To minimize the risk of POEM on such structures, it would be advisable for such key management to undertake decisions outside India. The Guidelines also contain a number of guiding principles for the determination of POEM, but fail to provide any guidance on how these principles would work vis-a-vis with each other. Further, they also use ambiguous terms to define the weightage of each principle and the extent of its relevance for determination purposes, leading to further confusion. In light of this, the UK Tribunal’s decision should provide practical insights on determination of POEM to tax payers and revenue authorities, alike.